Help Cuddly Dudley Live Pain Free! Dudley, a Mastiff puppy was found stuffed into a tiny box, tied to a fence in freezing weather. When Jurassic Bark Rescue saved him, he was in bad shape. He’s now been treated for everything but a bone deformity that makes every step agonizingly painful to him. After all Dudley has endured and the continuing pain, he’s still full of life, loves everyone and just wants to be a happy, playful puppy. With your support, he can be! You can help! 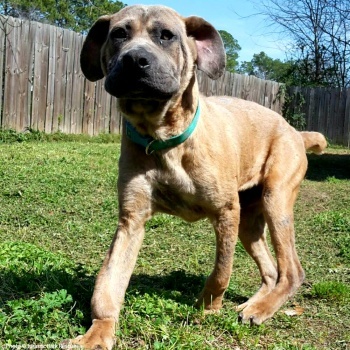 Just $20 helps Dudley receive surgery to fix his bone deformity – and live pain free!